Shoe racks need to be spot-on when it comes to display and hence it is pertinent to choose the ideal racking solution that will blend into the design of the showroom. Adequate Steel is a pioneer in offering end to end racking solutions for retail outlets across various verticals and has sketched a name for itself in the shelving and racking industry. 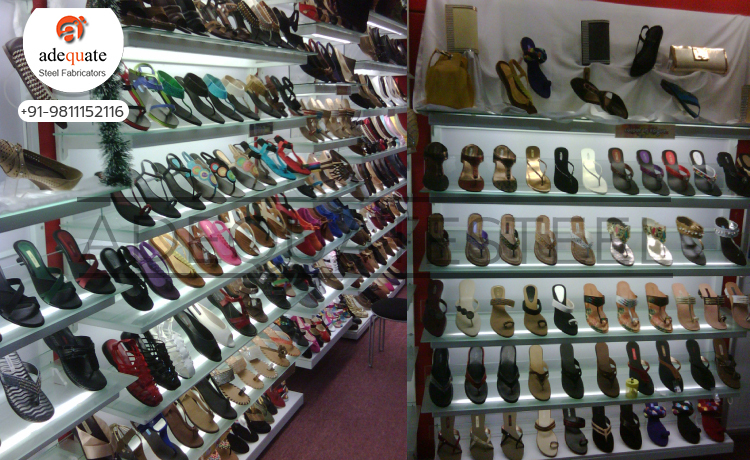 Adequate Steel offers the ideal racking solutions that can fit into any retail footwear outlet. The common racking system that is used is the rack and store system for footwear in the market where ideally the rack acts as a display unit as well as a storage unit. But for specific needs there are also separate display units that can be used to highlight a single model or to add prominence to the collection. Adequate Steel offers a combination of both these systems thereby offering standard modular choices that can also be altered and customized as per the requirement of the client. The standard choices offered are; metal slat wall shoe racks, glass shoe racks, mesh stopper shoe racks and footwear racks. Of the above mentioned, glass shoe racks are elegant and stylish and are significantly used for both displays as well as storage purposes. Glass shoe racks from Adequate Steel can be used in liaison with display racks or can be used independently. These racks are offered at varied lengths, heights and depths therefore offering a wide choice for footwear retail outlets.